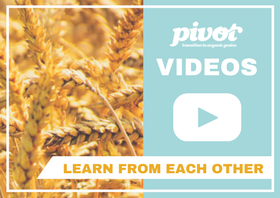 Watch the Pivot and Grow Production Videos to see what organic grain production can do for you! As we change our perspective, the world around us changes. New insights, more opportunities, and bigger successes all start with a small shift – a pivotal moment. This is what transitioning to organics is all about: taking incremental steps to make a meaningful impact.